Digital Atelier is a printmaking studio led by Dorothy Kraus, Bonny Lakota and Karin Schminke that has been on the leading edge of fine art digital printmaking in the USA since 1994. Combining traditional studio and media techniques with digital imaging, they produce original fine art editions using the latest printers, computers, imaging hardware and software. Their work is widely displayed both nationally and internationally and can be found in hundreds of corporate and museum collections including the permanent collection of the Smithsonian American Art Museum. For one recent project, the Digital Atelier came to Pina Zangaro in search of a way to package a limited edition print set which consists of a hard-bound book along with a folio of loose prints. The requirements for the packaging were something that would protect the work from damage while presenting it in a distinctive and unique way, without unnecessary decoration or personality. 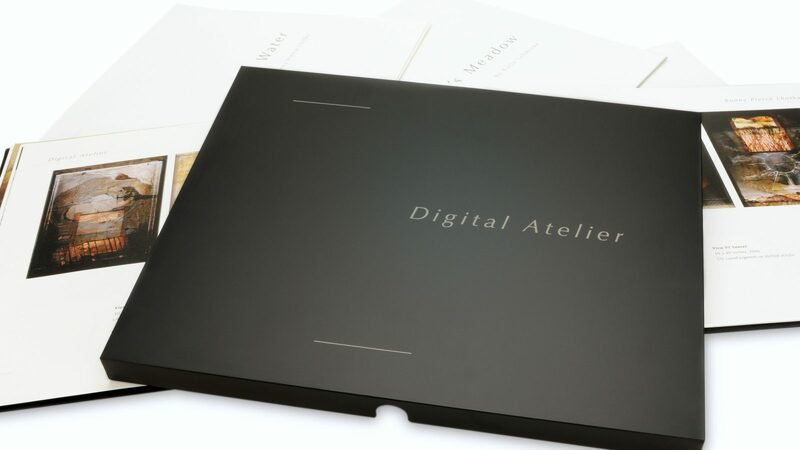 We settled on the black-anodized 11x14 Olema Presentation Box with a laser-etching of the Digital Atelier identity on the lid. The 110-piece edition was run on our CO2 lasers which removed the outer black finish of the lettering to reveal a silvery interior for maximum contrast. The overall look of the finished project was an unmitigated success and the limited edition sold out quickly.